The ancient Greek city of Miletus in modern-day Turkey was once an important port city. When the river’s location changed, the city was eventually abandoned. 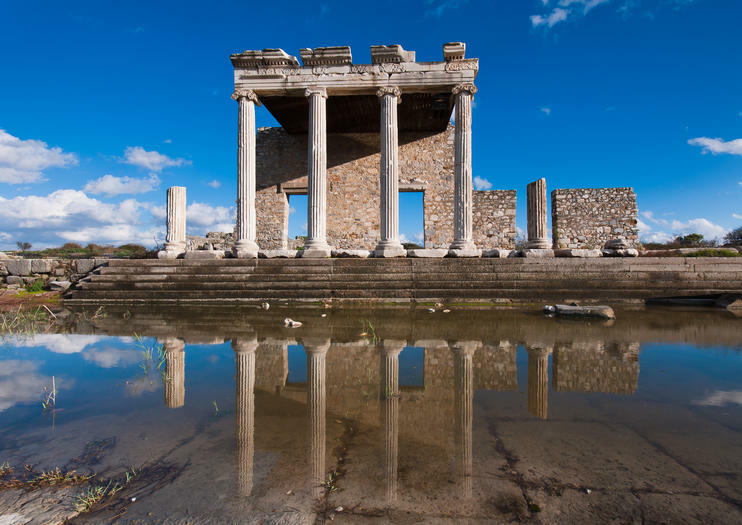 The settlement at Miletus dates back to 1400 B.C.E., and the city grew to be one of Greece’s wealthiest cities - thanks in large part to its position at the mouth of the Maeander River. Over the centuries, the river changed course, leaving Miletus behind. The city was later destroyed by the Persians in 499 B.C.E. and then rebuilt on a new grid plan that was to become the model for Roman cities. Excavations at the site began in the late 1800s, and today you can see the remains of a theater, a stadium, a Temple to Apollo, a Byzantine-era castle and church, and Roman baths. Miletus is a 36-mile drive from Kusadasi, located south of that city. The site is open daily from 8am-7pm, and admission is 10 Turkish Lira per person. Get out of the city and spend a day in the countryside on this 7-hour tour of Priene, Miletus and Didyma from Kusadasi. Your professional guide will meet you at your hotel and drive you out to Priene, formally an active port during the Ionian Federation. Next up is the town of Miletos, home to many famous world philosophers. At the Temple of Apollo of Didyma you can wander through the famous oracles and learn about its turbulent history. You’ll enjoy a delicious Turkish lunch during the tour and be returned to your hotel at the end of the day. On this private full day of sightseeing, you will visit the three important cities of the ancient world: Priene, Miletus and Didyma and learn about their history from your private guide. Visit the classical highlights of Istanbul in short and efficient time.Enjoy the beautiful atmosphere of Cappadocia with naturel beauties.Walk on the streets of the second biggest Roman city in the world.Enjoy the beautiful nature of Pamukkale and thermal facilities. Discover the lesser known ruins of Turkey’s Aegean coast on this private full-day tour from Kusadasi. Pose for photos by the remarkable Temple of Athena in ancient Priene; marvel at the gigantic Roman theater of Miletus; and discover the sacred Greek sanctuary of Didyma, with its famous Temple of Apollo. Highlights: Turkey is a treasure chest. Being in Turkey is like being in candy shop. On this trip, you will reward yourself for being in such an amazing country withh all the stories you heard in history classes taking action in this country. You will witness how lucky the Turks are and leave the country by drying your appetite . Priene, Miletos, Didyma tour guarantees a wonderful aegean holiday for you. Izmir excursion trip will also visit historical sites, listen to the professional guide's narration and eat a pleasant meal. We are waiting for you! Travel back in time and discover the glory of Ancient Ionia on this private full-day tour of Priene, Miletus and Didyma from Kusadasi. Marvel over Pytheos’ Temple of Athena and walk in the footsteps of Alexander the Great in Priene; learn about the classical philosophers that once inhabited ancient Miletos; then visit the sacred Temple of Apollo in Didyma. Arrive at Istanbul airport, meet our driver at the exit gate who is holding a board that your name is written. Transfer you to your hotel in the old district. Overnight in Istanbul. Your guide will meet you and a short walk takes you to the Blue Mosque which was completed in 1616. Our next stop will be the Topkapi Palace, more than just a palace, it is an assemblage of museums containing collections amassed by the Sultans for almost five centuries. Next we walk through the old cobbled streets down Spice Market. We end the tour with a visit to the greatest Bazaar of them all, the Grand Bazaar, one of the most extraordinary shopping experiences in the world. Overnight in Istanbul.